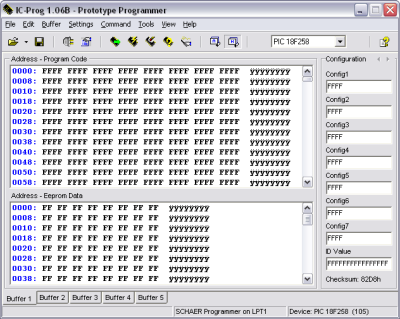 Schaer is a generic programmer circuit capable of uploading and downloading firmware to/from several electronic devices like microcontrollers and eeproms. This and other programmers came to my attention when I was working in CAMBADA, the robotic soccer team from the University of Aveiro, and since all other programmers available there were too expensive for me to buy or build, I decided to build one that was simple and cheap! This programmer has given me lots of trouble with high capacity PICs and I decided to abandon the project and build a ICD2 clone for MPLAB. What rests here are just the remains of the project. 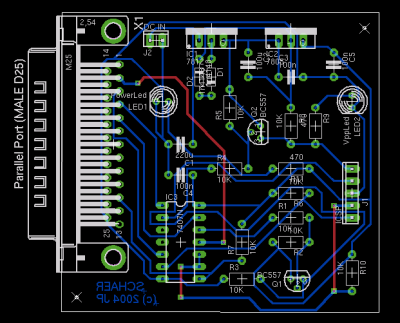 I can't remember where I found the first schematic on the web but after testing it in a white board I decided it was best to try a definitive solution on a PCB. 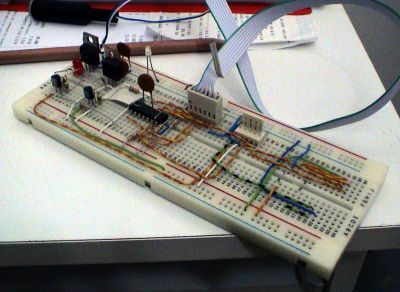 The circuit is very straightforward: it gets its control signals from the parallel port and sends it to the PIC being programmed. 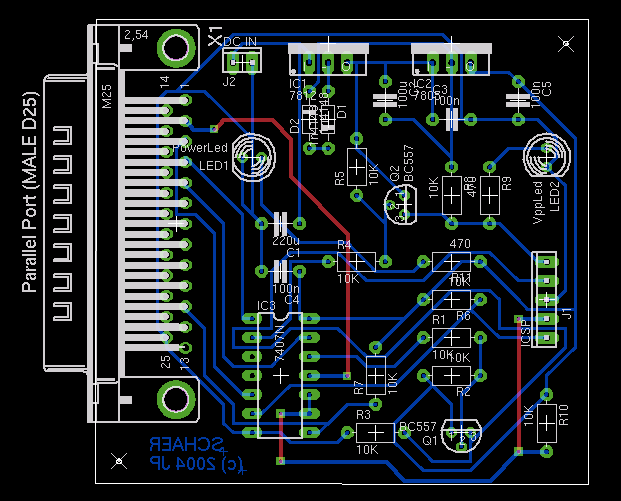 It needs one power supply of at least 15V and generates its 13V and 5V with 78XX regulators. 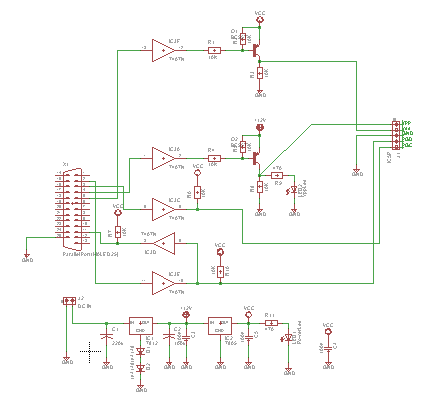 The schematic is a copy of the original schematic found on the web. At the top of this page is the first implementation on a prototype white board. Most of the tracks are on the bottom layer. Only three are at the top layer and can be made using wire jumps. This programmer can be used with icprog.I still have it around for some emergency. While using it for almost 4 years I decided to go to something more reliable like an ICD2 clone. 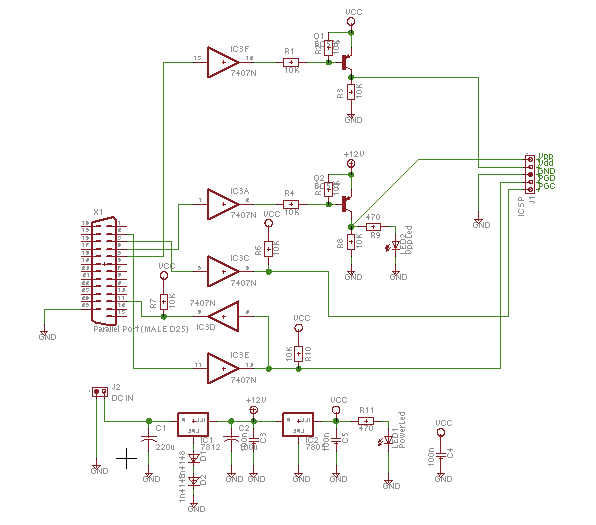 This circuit always gave me mixed results when programming some 32KB flash PICs. But it is quite good recovering pic12f629 that don't respond to ICD2 anymore!